Starring Tom Hardy, Michelle Williams, Riz Ahmed, Jenny Slate, Scott Haze, Michelle Lee, Sope Aluko, Reid Scott, Sam Medina, Jared Bankens, Wayne Pére, and Woody Harrelson. Venom’s journey to the big screen hasn’t been easy. With the best forgotten appearance in Sam Raimi’s Spider-Man 3 and the various production issues that this 2018 version has had, it arrives with more of a whimper than a bang. 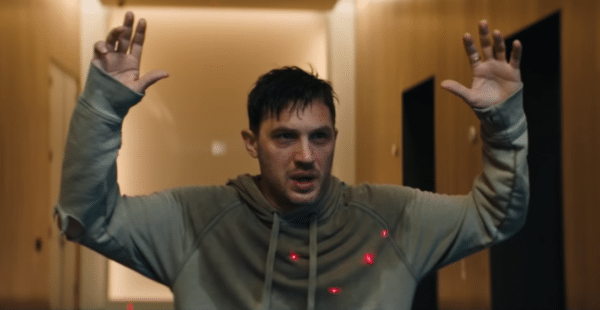 Tom Hardy plays Eddie Brock an investigative reporter who is trying to take down shady scientist Carlton Drake (Ahmed). 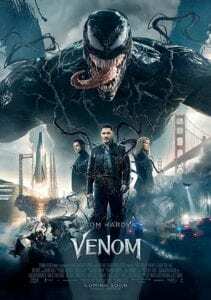 After breaking into Drake’s lab with the help of scientist Dora Skith (Slate), Eddie gets infected by the symbiote Venom and they have to work together to take out the bad guy. The first half of Venom is really funny and has some great action sequences. The second half is a mess of CGI that’s so bad you can’t really tell who’s fighting who and the finale seems to happen out of nowhere. The build-up is so entertaining that when it falls flat it is bitterly disappointing. As Eddie Brock/Venom, Hardy seems to be having a blast and plays up the comedy. It’s silly and slapstick but he goes for it even when he’s diving into a tank of lobsters and making an arse out of himself. This is a testament to Hardy’s charisma as the character of Eddie Brock is paper thin and we find out little about him to make him worth investing in. 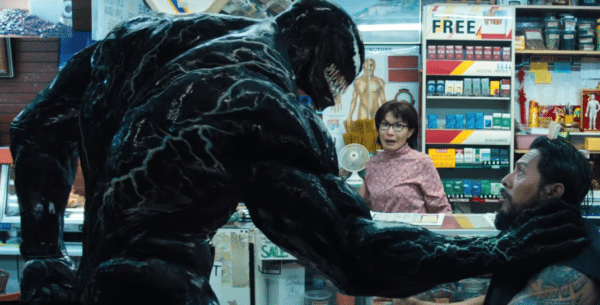 His performance as Venom is also fun and entertaining and the best part of the film. A lack of characterisation is a big issue with Venom. Riz Ahmed as the “big bad” is one dimensional and despite the actors calibre he’s left with nothing to do but look menacingly at computer screens and preach about saving the world. Similarly Michelle Williams as Eddie’s ex-fiancee Anne has zero to do other than save Eddie a couple of times and be in the background when required. It’s a shame as the acting talent on display is phenomenal, but the script has let them down. 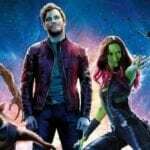 Rumours of lots of scenes being cut have circled the film and it does feel like a big chunk of story is missing. It’s a little slow to begin with and then as soon as Venom gets interesting, we’re forced to endure a CGI fight that may leave some feeling like they’ve had motion sickness and then it’s over. Venom feels like a tease for a much more interesting film (we do get a mid-credits scene) and I would want to see more of this world, but only if we’re guaranteed a better script. Whether it was studio interference or the classification board that made changes I’m not sure. What I do know is that it is not terrible but it is far from brilliant, it feels average which is perhaps even worse.